Hiking is one of the best ways to see the beauty of the Blue Ridge Mountains. There are countless trails in the area, especially along the Blue Ridge Parkway. From the myriad destination hikes and the 26 mile network at Moses Cone Park, to local sections of the Appalachian Trail and the Mountains to Sea Trail, deciding where to start can be overwhelming. 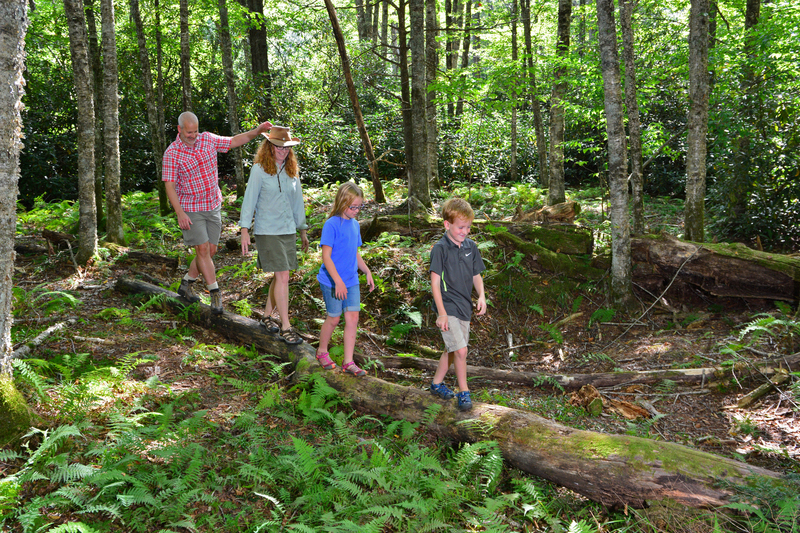 Here’s a short list of some of the most popular hikes closest to Blowing Rock, and they are well-loved for good reason. You’ll find easy parking access, well-defined trails, and sights unique to this region of the Blue Ridge. Take your pick and get out there! Easy | 1 mile loop | Access on Hwy 221, one mile from Main Street in Blowing Rock. This picturesque loop is a regular stop for many locals, and you’ll see plenty of people out walking dogs or taking a jog on most days. The trail is flat, well-maintained gravel, following a path around Bass Lake. The lake was built by Moses Cone as part of his estate, and you can see the Flat Top manor house from various points on the route. The trail is a nice location to see plenty of waterfowl and beavers and is a good fishing spot, too. 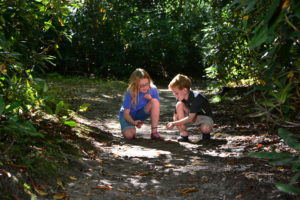 The loop connects to the other 26 miles of carriage trails in Cone Park, and can be a place to take laps or a great starting point for a longer hike. This varied trail follows the path of New Years Creek from Annie Cannon Gardens. It starts out easy, with a wide path that crosses the creek and passes behind properties in the Mayview community. After crossing the water again, the trail descends sharply into John’s River Gorge. Along the way, views of cascades and Glen Burney Falls are a beautiful highlight. Glen Mary Falls awaits at the bottom of the trail. Because of drop offs by the falls, this trail approaches steep and treacherous areas- take care to obey posted signs and stay on the trail. The trail is one way, so once you reach the bottom, the strenuous hike back to the gardens begins. The elevation change is worth it, however, as waterfalls and various stages of wild blooms and foliage are your companions along the way. Following the Boone Fork River and tributaries, this loop provides a varied look at local flora and terrain. Through hardwood forests and rhododendron thickets, the trail also passes by small waterfalls and cascades. The trail intersects and shares some route with both the Tanawha Trail and the Mountains to Sea Trail, so take care to note signage at intersections. This trail is especially popular because it’s easy to find and provides one of the best views in the area. From the parking area, take the trail up to the fork and turn left to go across the little wooden bridge. This is the shortest route to the top. It’s quite a climb, and you’ll know you’ve arrived when you reach the boardwalks. These have been built to protect the fragile lichen and shrub communities on the ridge- please stay on the boardwalks and trails to help ensure their survival. The trail along the ridge is actually the Tanawha Trail, so there is plenty more to see if you want to keep following the path once you reach the top. Keep in mind that Tanawha is not a loop, and that you’ll need to double back to return to your vehicle. The vista on the ridge is expansive, with views that include Grandfather, Grandmother, Hawksbill, and Pilot Mountains, along with various communities far in the distance. On very clear mornings, you can see the Charlotte skyline. Another carriage trail in Cone Park, this route takes you to the top of Flat Top, where a fire tower waits to provide a 360 degree view above the canopy. The distance is long, but the trail is wide and inclines are not very steep so most consider it a moderate trail. About halfway up, the trail crosses a beautiful highland meadow where the graves of the Cone family are found in a small cemetery. From the top of the firetower, the communities of Blowing Rock, Boone, and others can be easily seen. The trail is out-and-back, so your return trip follows the same path.